Alaskans earned $1,884 last year for... nothing at all. Trans Alaska Pipeline. Source: USGS.gov. Income investors are always on the hunt for the best dividend stocks. But when it comes to dividends, how far are Americans willing to go? For $1,884 a year, the answer is Alaska. Here's what you need to know. Alaska has a lot of oil and gas. Economically, there's really not much else. In recent years, tax revenue from crude oil and natural gas corporations have accounted for more than 90% of the state's general budget and the majority of its overall revenue. In the mid-1970s, when the sheer size of Alaska's energy sources first emerged, the state government established the Alaska Permanent Fund, an "oil endowment" of sorts that maintains 25% of all government royalties from oil and gas production. From its meager beginnings, the Fund has since ballooned into a $52 billion behemoth. That's larger than the entire national funds of oil-rich nations like Angola, Mexico, and Venezuela, and around 10 times the size of the next largest state fund. Confronted with that much money, the state of Alaska took a cue from the corporate world and has distributed a cash dividend to its citizens every year since 1982. Since the fund's principle can't be spent, its annual dividend has ranged from a few hundred dollars to more than $2,000. But while 2014's distribution clocked in at a sizable $1,884 per person, the days of steady growth and increasingly large dividends may be coming to a close. The end of an energy era? An annual dividend worth $1,884 sounds fairly fantastic to an income investor. If you invested in a stock with a 3% annual dividend yield, you'd need to own $62,800 worth to walk away with that much cash every year. Add in the fact that Alaska levies neither an income nor sales tax, and you're left with one of the friendliest markets an investor could ever hope for. But the fund's past performance may not be representative of its future potential. 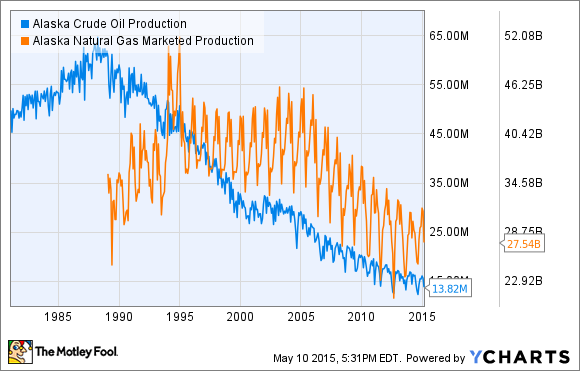 Alaskan crude oil production peaked in 1988, and natural gas hit its highest production point in 1994. Alaskans aren't ignoring the future, and they're currently planning to reinvigorate their energy economy with the "Alaska LNG Project ." Clocking in at an estimated $45 billion to $65 billion, the project would include a gas treatment plant, an 800-mile pipeline from Alaska's northern coast to its southern one, and an LNG plant to ship that stored energy all around the world. With ExxonMobil Corporation (NYSE:XOM), BP plc (NYSE:BP), and ConocoPhillips (NYSE:COP) all on board, this could be the Frontier State's big break. But that big break is still in early stages development, and there's no getting around the fact that its energy future is currently in flux. Oil prices have crashed around 50% in the past year, and Alaskan officials have been scrambling to rebalance budgets. The government calculated 2015 state spending based on oil prices of $105 per barrel. So far this year, average prices have come in closer to $50. More recent estimates suggest the state may have to turn its $6 billion budget into a $2.5 billion one, and the governor has already laid out an Alaska austerity plan for the next four years. Oil drilling in Alaska. Source: Arctic.gov. Alaska's Permanent Fund isn't going away any time soon. But Alaska residents (and investors) should know better than to look at dividend distributions alone. If the foundation of Alaska's economy crumbled, the Permanent Fund would be small redress for living in a state with no revenues. The Fund's distribution would need to be nearly eight times as large to simply allow Alaskans to live above the current poverty threshold. Likewise, investors need to look beyond a dividend stock's distribution to its underlying business. Is the corporation simply sitting on more cash than it knows what to do with, or is it a steady earner cash cow that continues to share its growing and diversified profits with income investors? Alaska may be the best energy dividend stock today, but energy dividend investors and Alaskans should keep a close eye on their respective investments and residence in the years to come.